Don’t look now but the dreaded sugary beverage tax is back. That’s the word from Cicely Simpson, executive vice president for public affairs at the National Restaurant Association. Health activists around the country are now pushing a new crop of initiatives that would slap taxes on soda and other drinks. “This is coming back up with a very big momentum,” Simpson said. 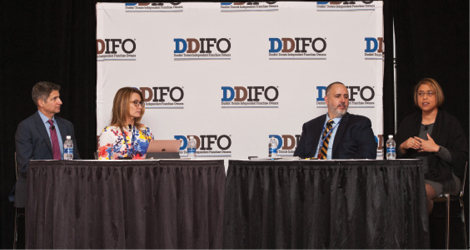 Simpson was one of a panel of experts on regulatory and legislative issues that spoke to Dunkin’ Donuts franchise owners at the DDIFO National Conference, held Oct. 30-31 at Foxwoods Resort Casino. A good-news, bad-news theme emerged during the wide-ranging discussion by the panel, which featured Rep. Themis Klarides, the Republican minority leader in the Connecticut House of Representatives, Joseph Giannino, DDIFO’s Massachusetts lobbyist and the principal of Government Relations Group, and Robert Branca, who is co-chair of the Government Affairs Committee for the Brand Advisory Council. 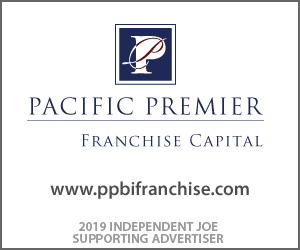 Franchise owners and their representatives are enjoying impressive access to the new and more business-friendly Trump Administration, with progress being made on some key issues important to Dunkin’ and other franchise owners. Yet lobbyists for the restaurant and franchise industry are increasingly focusing their efforts on the state and local level, where activists are pushing an array of new laws and regulations, from scheduling rules to sick leave, the panelists noted. Possibly the most surprising development is the reemergence of the sugary beverage tax, which fizzled out a few years ago after a major defeat in New York. Michael Bloomberg saw his plan to slap a tax on large sugary drinks of 16 ounces and up go down to defeat when New York State’s highest court shot it down in 2014. But the billionaire and former Big Apple mayor is back, spending millions of his own money to back proposals for taxes on sugary drinks in cities and states across the country. Bloomberg has reportedly pumped money into initiatives and elections in New Mexico and Cook County in Illinois where the beverage tax is being debated. Other hotspots include Colorado and California, Simpson said. “We expect anywhere from eight to 10 states to have ballot issues on the sugary beverage tax,” she said. In order to effectively battle sugary beverage tax and similar proposals targeting franchised restaurants, the National Restaurant Association and similar groups have had to shift the focus of a significant part of their lobbying to the city and state level. The restaurant association has been reaching out and holding meetings with mayors and city councilors across the country as part of its “kitchen cabinet” initiative, according to Simpson. “Yes, Congress is still important but not everything is happening in Washington,” Simpson added. Two other key players in the Connecticut and Massachusetts legislative scene seconded the need for vigilance at the state level by franchise owners and their representatives. Rep. Klarides, who is widely viewed as a strong candidate to be Connecticut’s next Governor, advised franchise owners to take the direct approach when there is a bill or issue they are concerned about. She urged business owners to set up face-to-face meetings with their representatives, noting many may not have a background in business or an understanding of the day-to-day issues franchise owners face. “I can’t express enough how important it is for people to put a face with the issue,” Klarides said. Joseph Giannino, a former elected official who has led lobbying efforts in Dunkin’s home state for several years, also stressed the ongoing need to educate lawmakers on the realities of running a business. For example, Giannino said one of the next big mandates he expects to see in the next few years is a proposal for sick leave for workers with pets. If there are continued storm clouds on the state and local level for Dunkin’ franchise owners, prospects in Washington are brightening as the new Republican administration starts to take charge of the government’s regulatory apparatus. Simpson, who formerly held the job of government affairs chief for Dunkin’ Brands, said the Trump Administration has made it a point of working closely with restaurant and franchise groups, seeking their input on efforts to scale back regulation or craft new initiatives. It is a departure from the more aloof Obama Administration, where such meetings just didn’t happen, she said. One example is a new “apprenticeship” program the Department of Labor is developing to help businesses find the workers they need in a tight market. These include a shift away from efforts to aggressively enforce new joint-employer rules that made franchisors liable for pay and other working conditions that franchise owners have traditionally been in charge of, as well reviewing the Obama Administration’s plans to dramatically expand the number of workers, including managers, eligible for overtime. “Sometimes the bedlam overshadows the activity that is happening,” Cresanti said. Still, franchise owners hoping to solve their labor woes by bringing in more foreign workers through the H2B visa program aren’t likely to see their wishes fulfilled. “Compromise immigration reform is not going to happen,” Simpson said. 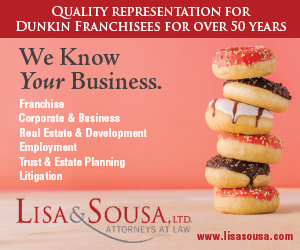 In Dunkin’ circles, that development will be closely watched – as will other labor-related issues coming down the pike – because franchisees across the Dunkin’ footprint are concerned about a shallow labor pool. It was the issue that elicited the most questions from attendees at the DDIFO National Conference.